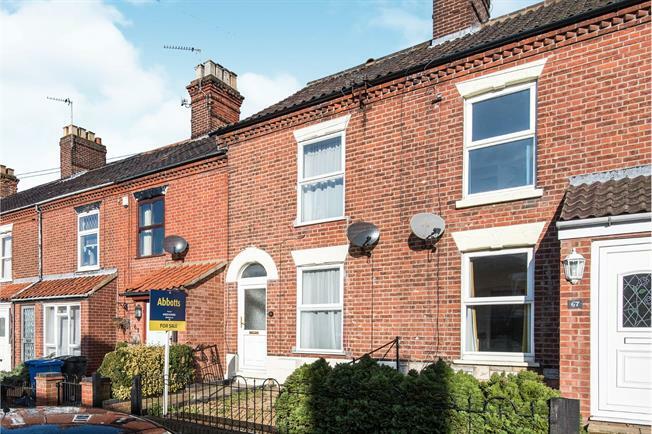 This charming two bedroom terrace house has been modernised and refitted to a high standard throughout. Marlborough Road is a short walk from the market place, Tombland and the historic Norwich lanes. Close by are a gym, doctors surgery, pharmacy, and dentist and a public house at the end of the road. The property is well placed for the riverside path offering a selection of public houses along with a number of convenience stores. By car it is easy to reach the A47 and A11 in fifteen minutes for access around the county. This Victorian terrace house is a wonderful example of its type combining the best of both worlds with character features and modern enhancements. Offering two reception rooms on the ground floor there is plenty of space to entertain. To the rear is a white kitchen with sleek lines leading to a lobby with garden access and a door to the refitted shower room. The first floor has two sizeable double bedrooms with the front bedroom benefitting from built-in wardrobes to one wall. Both bedrooms retain period cast iron fire surrounds. The rear bedroom has access to the en-suite bathroom. To the rear is well proportioned garden mostly laid to lawn. To the rear the area the current vendor is using as a patio is actually an area for off road parking accessed by a service road running behind the property. Be sure to arrange to view at your earliest convenience.